When I choose my motorcycle gear, I walk the delicate line between comfort and safety. I try to find the best looking, safest gear I can, but it's not an easy thing to do. As most women, I find myself wanting to look good more than I want to be safe! I know that's not the best choice, however, and I try to keep myself in check and make the safest choice. When you choose biking gear, you're going to need to know a little bit about the materials you'll be choosing from. 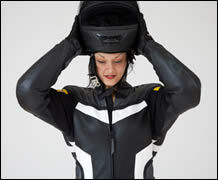 You'll be choosing between synthetic materials, such as nylon and Kevlar, and leather. Begin by assuming that all leathers are NOT the same. Just because a jacket looks good and it's made of leather does not mean it will protect you when you have an accident on your motorcycle! You'll need thick, durable leather, like cowhide. Cowhide is a smooth leather that can come in varying degrees of thickness. You'll want a cowhide that is at least one millimeter thick. In the leather industry, thickness is typically indicated by the weight of the leather. Three ounces of leather weight is equal to 3/64th of an inch in thickness, which is slightly more than a millimeter. So your leather jacket or your leather pants should be at least three ounces in order to offer you the protection you'll need while riding. You'll want to find leather than has been tanned to create a more uniform look and sealed to protect the leather from the elements, especially water. These two processes will make your leather easier to maintain and to keep clean. I think leather is a great option for riding gear. I find it really comfortable to wear and comfortable to ride in. My leather jacket goes with me on every ride! Synthetics Synthetic materials, specifically nylon and Kevlar, are becoming more and more popular as materials for motorcycle riding gear. One of the reasons for this is that these materials can be more comfortable than leather because they can stretch and breathe. These materials can also be created in a variety of colors, which can offer choices to the biker for style as well as for riding protection. Wearing brightly colored clothing while you're riding is often a safer choice than simply wearing a brown or black leather. Bright colors attract the attention of other motorists, both bikers and drivers, and can alert others to your presence on the road. When you're looking at synthetic material, look at the quality of the construction of the piece. Check the seams to see that they're straight and uniform. You'll want to see whether or not the seams are reinforced and that the points of tension are reinforced as well. Look at elbow, shoulder, and knee areas to see how they're constructed. You'll want to be sure about the fit of the synthetic material. Don't count on the material being more supple than leather. Try on everything and wear it sitting on your bike. Be sure that the materials bends in the places you want it to. You'll need these pieces to feel comfortable. I know synthetics offer more options for riding gear, but like I said, my leather jacket and I are inseparable and I just can't bring myself to buy a synthetic jacket yet. I know I should add some reflective tape to my jacket, but that's just not my style. I did, however, buy a synthetic vest that's bright yellow and has some reflective tape on it. I have been known to throw that on when I think the visibility on the road is poor. It's easy to put on over my jacket - and easy to take off when I don't want anyone to see it! Be comfortable in your riding gear, and remember to choose the safe options!